EDITOR’S NOTE: This week, in preparation for the premiere of “America’s Game: The 2010 Green Bay Packers,” we’re revisiting the Pack’s America’s Game chapters of 1996, 1966, and here, 1967 – with the help from the producers of those films. • Narrated by (Go Tigers!) heat-packing Hawaii tough guy Thomas Magnum, aka Tom Selleck. 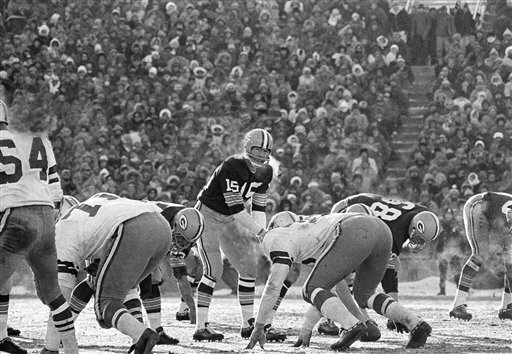 Bart Starr under center in the 1967 "Ice Bowl." 1967 marked the last run for a legendary team – and it was also the year that a young film-making company hit its creative stride as pro football mythmakers. “America’s Game: The 2010 Green Bay Packers” premieres Wednesday, September 7th at 9 pm/ET only on NFLNetwork.